When you travel with your dog, there are many things to take into consideration, and choosing the best dog travel crate is one of the more important ones. A reliable, secure and comfortable dog crate for travel will provide a peace of mind for you and a safe place of rest for your pup. More pet owners today travel with their dogs than ever before. Some dog it properly and safely, while others take unnecessary risks or forget about the appropriate pet travel safety practice as laid out by the FDA at the cost of their dog's health. When traveling with your dog, it's important take certain precautions and secure your pet for a stress-free journey. Purdue University vets are advising owners to choose safe dog travel crates that are appropriate for that specific trip. Choosing the right type of dog travel crate is essential, and will depend on the type of trip you're taking. Are you traveling in car? By plan? By train? Maybe you decide to travel on a motorcycle or even a bicycle. For some, soft sided dog crate may be the ultimate choice, while others will need a metal dog crate. There are many different types of best dog crates for travel that will fit any form of transportation choice. * Click on the best dog travel crates for more information, prices and details. Alternatively, scroll below to read reviews and our notes. Below is a list of dog travel crate reviews from each category and type. To learn more on how to pick the right type of dog crate for travel, scroll down below. What are the Best Dog Travel Crates? EliteField is one of the most popular dog crate manufacturers who won hearts of pet owners through low pricing and high quality materials. Their 3-door folding crate is the first of two soft sided crates to make the list of best dog travel crates due to great balance between travel-friendliness, features and ergonomics. Typically, when you put your pet in a crate to travel you want to be sure the crate is sturdy and won't collapse on your pet. However, if your dog will be in your care at all times, a soft crate may be the most appropriate. What I love about these EliteField dog crates is that they are soft and extremely easy to set-up and fold-down. There are no tools involved, and it only takes a couple of seconds. It comes with a carrying bag for simple storage and a mat for your dog's comfort. The entire crate breaks apart quickly for easy washing as well. Another feature that I like is the fact that it has a top, side and front door for easy accessibility. The EliteField 3-Door soft dog crate is also equipped with two convenient accessory pockets. It has a strong steel tube frame and is very well ventilated just like most types of soft dog crates out there. EliteField travel dog crates come in several different sizes and will fit majority of dogs except for extra small or extra large breeds. You can also pick from a ton of different crate colors. Arf Pets 3 Door Crate with Strap – Essentially the same type as the EliteField's crate, Arf Pets' dog travel crate is a great alternative with a slightly different design. It's a less popular option among pet owners who travel, but it's available in different sizes and several new color schemes. The only reason to buy Art Pets over EliteField is if you prefer their colors or offered sizes, because the price, materials used and the implemented design features are exactly the same as EliteField's. Go Pet Club Crate – Very different to EliteField, high quality Go Pet Club is another great best dog crate alternative if a rounded top/ceiling is what you wish for your dog to have more room inside of a crate. However, this makes the crate less ergonomic and it takes up more space. 2PET Foldable Dog Crate – Another similar design as best dog travel crate from EliteField, this one is less sturdy and softer than EliteField crate, which can be either a good or a bad thing, depending on what you're looking for and your type of travel. They're available in similar sizes and three colors. As for the features, they're exactly the same as EliteField dog crate, but this one is cheaper. Just like EliteField dominates the best dog travel crate market with their soft crate, Petmate is the leader with their plastic dog crates for travel due to high quality materials and the lowest prices. This Two Door Top Load dog kennel is less pricey than majority of its competitors, and through all of the features it offers, it's easily the best dog travel crate if you're looking for a plastic and sturdy option. Not only is the crate comfortable for your dog to travel around in via vehicle, but these plastic dog crates meet most airline crate requirements if you need to travel by plane with your dog. They are well built and extremely solid. 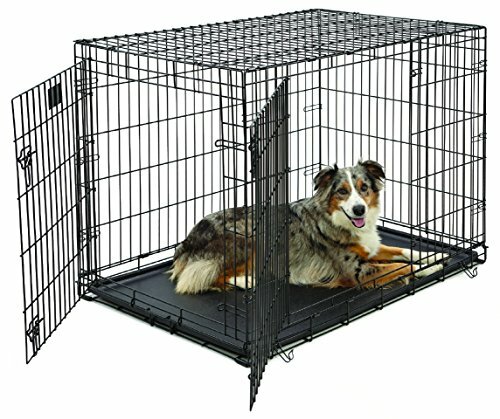 In fact, if you're crate training your dog at home, this would also be a great model to choose. The Petmate Two Door dog crate for travel is very easy to clean because it's all plastic and, although they are made with heavy duty materials, they are surprisingly lightweight. These pet travel crates are equipped with tie-down holes in all four corners to make them more stable while traveling. They also include a hole so the door can be secured with zip-ties during travel. All of Petmate plastic travel dog crates, including this one, come in a variety of sizes to fit most dog breeds, although you'll be hard pressed to find one for a large breed (mostly, it's for small to medium dogs). The wire doors of these crates lock shut with a chrome squeeze door latch. The crates are shipped as two half shells and are very easy to assemble. They come with no-rust plastic wing nuts. These crates are also equipped with side air vents. Aspen Pet Pet Porter Plastic Kennel – This is a great alternative to Petmate's best dog travel crate because Aspen Pet offers larger sizes than Petmate ever has, with dogs up to 90-100 lbs. You still can't fit a very large breed here, but medium dogs won't have any problems, provided you can pick them up. Aspen Pet travel crate is, however, more than twice as expensive due to large size. AmazonBasics Two-Door Top-Load Kennel – Amazon offers their own dog travel crate as a direct competitor to Petmate's option, and this one has almost the exact features but is available at a slightly lower price and with slightly lower quality. AmazonBasics travel crate for dogs also has only two sizes for small dogs and available only in one color. Other than that, it resembles Petmate's crate very closely. Favorite Top Load Portable Carrier – Pet owners with very small and teacup dog breeds who are looking to take short trips, this can be the winner. Favorite's best dog travel crate alternative has a good looking design and is the cheapest crate of all listed here. However, it's only good if you're not traveling long distances since the materials appear to be low quality and I wouldn't trust this on a plane. Another leader in its category, PetPeppy's premium airline approved dog travel crate is visually appealing, stylish and comes with a ton of features that makes it easy to carry your dog. It only comes in a single color (black with red accent) and have huge mesh windows on each side that will give your dog lots of ventilation. It's expandable that allows for tons of extra storage. As with all other pet carriers, this best dog travel crate doesn't need any assembly and it somewhat collapsible if you need to store it away. You won't need any tools for this one either. PetPeppy dog travel carrier is not waterproof or water-resistant and may be difficult to clean due to its construction and the materials used. The main reason a pet owner would buy this is due to how easy it is to carry it, especially if you have small dogs. The expandable space is also a huge advantage since you can store your dog's toys and other supplies without having to carry them with you, but that obviously makes the crate less ergonomic and expands its sides, which makes it less easy to carry. For what it is, PetPeppy is easily the best dog travel carrier compared to others because it's more sturdy and safe for dogs. While no additional sizes are available of this carrier, you can fit a small or small-medium dog into this travel dog crate but note that a lot of dogs find these crates uncomfortable during long trips, therefore it's best for short distance travel and short flights where you can attend to your dog faster. AmazonBasics Black Soft-Sided Carrier – Once again, Amazon offers its alternative to the best travel dog crate for a cheaper price. This time, it may well be worth it unlike with the plastic travel dog crates. The design of AmazonBasics pet carrier is much more simple, but the materials used are good quality and if you don't require expandable storage space, you can get this one for half of what PetPeppy costs. Sherpa Original Deluxe Carrier – Sherpa has been manufacturing carriers for decades, and their original deluxe travel dog carrier is easily the best one of standard dog travel carrier options. It's more stylish, the quality of materials used and the design itself is higher than that of PetPeppy or AmazonBasics, but it's more expensive than Amazon's pet carrier and it doesn't offer the extra features that PetPeppy does. OxGord Rolling Backpack Carrier – This is something a little different for those who aren't happy with standard best travel dog carriers. OxGord's rolling backpack pet carrier is a perfect choice for people looking for something like a dog backpack carrier but suitable for long distance travel. It's very durable, has wheels, is fairly easy to store but will not collapse completely. Continuing the trend with leaders topping our list of best travel dog crates, MidWest are best known for their top quality metal dog crates. This Midwest Life Stages folding metal dog crate in particular can be used throughout the life of your dog, and it's a great alternative to soft travel dog crates. Normally, it's recommended to buy the crate for regular use as opposed to just travel, and when looking for it, make sure to buy one for your dog's adult size (if you still have a puppy that is). Metal dog crates are good for both plane and car travel if you know how to use them. Some dogs prefer metal crates over soft, but they're not always the best option. A divider panel is included with the crate to adjust its size as your dog grows. This gives the option for the crate to be used for more than one dog, as the size of the cage can be adjusted for each dog. As with all dog cages, because it's a metal dog travel crate, it's very easy to clean and it's super durable and strong, which can be the deciding factor for most. It has double doors for front and side access. It also has slide-bolt latches that provide easy entry as well as security. The Midwest Life Stages folding metal crate is surprisingly uncomplicated to set up and put away, since it folds flat. When you consider how you're going to travel, this can be either the best dog travel crate for your trip, or the worst, so make sure you know where the crate is going to go and how it's going to be used. All MidWest Life Stages travel dog crates include handles for easy carrying and a plastic pan for comfort inside the crate so your pup isn't sitting on the metal bars. Metal crates like this one are great because you can see your pet from all angels since there there are no hidden sides. Midwest has seven different sizes for your dog that adjust to his growth and the divider panel is a huge advantage over soft dog travel crates. Overall, metal dog travel crates are the most optimal option for many pet owners, especially those who travel in cars very often. MidWest iCrate Folding Metal Dog Crate – The best alternative to Life Stages travel dog crate is another option from the same company, their extremely popular iCrate. With double doors, tons of different sizes, heavy duty latches and carrying handles, this is easily one of the best metal travel dog crates. You will not go wrong with either Life Stages or the iCrate since they offer similar features. AmazonBasics Double-Door Folding Crate – Yet again Amazon is there to offer a cheaper alternative to MidWest travel dog crates. Their AmazonBasics double door folding crate is exactly the same as the iCrate, and costs a few dollars less. Otherwise, the design has been copied from MidWest. It may or may not be worth it when consider that MidWest also offers great customer support and advice for their fan base. Venturing away from standard best travel dog crates, we've now coming into the territory of heavy duty dog cages for travel which is yet to be dominated by one single manufacturer. However, the Variocage is one of the best heavy duty dog travel cages due to its smart design, stylish looks, high quality material and crash tests. These are very expensive travel cages for dogs, but well worth the investment if you're looking something for large dogs and long distance travel. Not only do these heavy and indestructible dog cages look very stylish, but they've been ranked best for crash tests. These travel dog crates are very comfortable for dogs and easy to clean too. In addition, for added security, the Variocage includes a built-in key lock. Variocages heavy dog travel cage is not a popular option, mostly due to its large price tag and the fact that very few dogs and pet owners need such type of travel crate. That said, these indestructible dog cages look like something from Jurassic Park and are the only crates that are rated using government safety standards for the protection they provide during accidents. That means that they passed the front, rear and rollover crash tests. Also, all models include an emergency escape as an additional safety measure. This crate really is a must have for any dog owner that frequently travels with their pet in the car. With all of its great features, this heavy duty dog cage is not without its faults, and the main issue is that it's difficult to put together. Unlike metal dog crates like MidWest iCrate, the MIM Safe Variocage dog travel cage needs to be assembled from scratch which takes time, effort and understanding. These dog crates come in 14 changeable sizes to fit most dogs, and they come in four different models. This gives you a better chance at finding a suitable fit for your vehicle or one that will pass the guidelines for the method of transportation that you will be taking. ProSelect Empire Cage – For a significantly less money, ProSelect is a decent alternative to Variocage if you're going for a short distance car travel and it's been rated as one of the best heavy duty cages for dogs. It's not crash tested, isn't as stylish or as heavy and large as Variocage, but they will be an appropriate choice for most pet owners with medium to extra large dog breeds. Sliverylake Heavy Duty Metal Cage – An even cheaper alternative is this heavy duty metal cage from Sliverylake. The design is simpler and it's not as sturdy as either ProSelect of Variocage, but if you don'g have a hyperactive extra large dog, then this may be a better choice considering that you also pay significantly less for it. The standard features will be more than enough. Petego Pet Tube Car Kennel – And for something completely different, if you don't have an extra large dog who needs an indestructible cage but rather looking for something to fit multiple dogs at the back of your car, this may be a great alternative. This pet tube travel car kennel from Petego will be much cheaper and look substantially better in your car, and it also folds. Your dog's size and the mode of transportation you will be taking are the two biggest factors to take into account when choosing the best dog travel crate. Your pet will have to fit comfortably in the carrier without having too much excess room, and the carrier will need to be appropriate for the car, plane, train, or other mode of transportation that you'll be taking as well as easy to transport from location to location. If you and your dog are taking a trip by vehicle, finding the best travel dog crate that is suitable and fits your car is actually an easy task, since majority of these travel carriers are designed for cars first. If you are both travelling by plane, it is a good idea to be aware of the airline crate policies before purchasing one of your own, as airlines require specific dimensions and rules for travelling with pets in crates. Fortunately, some of the pet carriers are already airline approved, and others are easy to get accepted. Finally, you'll want to be sure to check with the travel agency (if you're using one) and all locations where you will be staying to make sure that both pets and the type of crate you're taking are allowed. Remember to ask if they have unique crate specifications. This is particularly true for airlines, because each airline has their own guidelines, but the same can be said for every bus service, train service, and hotels. Planning ahead could save you from dealing with unnecessary issues during your travels. Measuring your dog is the only way that you're going to be able to select the most appropriately sized best travel dog crate. Some pet carriers will give weight guidelines and other will give breed specifications, but you shouldn't trust these guidelines. Two dogs, both weighing 55 pounds, can have completely different measurements, and the same can be said for two different dogs of the same breed. 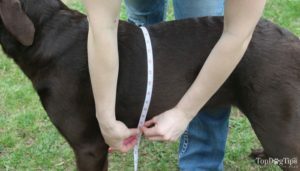 When measuring the length of your dog, you should begin at the base of the neck and measure to the base of the tail. Add 3 inches to this and that should be the minimum crate length that you should be looking for. To measure their height, simply start at the ground and measure to the top of their shoulders. Add 3 inches to this measurement to get the minimum crate height you should be looking for. Quick tip: If the measurements are between two crate sizes, always choose the larger size.Once you've measured your dog, you'll know the appropriate size crate to choose and now you're well on your way to choosing the best dog travel crate for your canine companion. Pet stores are full of travel crate options and you can also shop online, but the choices there will be nearly infinite. Researching your options will be the next step, and I've done a ton of legwork for you with the above list of twenty best dog travel crates, listing their specifications and the modes of travel they are best used for. These travel dog crates are all safe, comfortable choices for your canine, but you'll have to find out if they meet the traveling guidelines that you need to follow and pick the right size after measuring your dog. I’m disappointed that this article doesn’t take car travel into serious consideration. The crates they recommend do not do well in a car accident. And, MANY more dogs travel in cars than any other means of transportation. The crates in this article may be okay for restraining a dog in a plane, car or home, but they aren’t very good for protecting our dogs from harm in an accident.